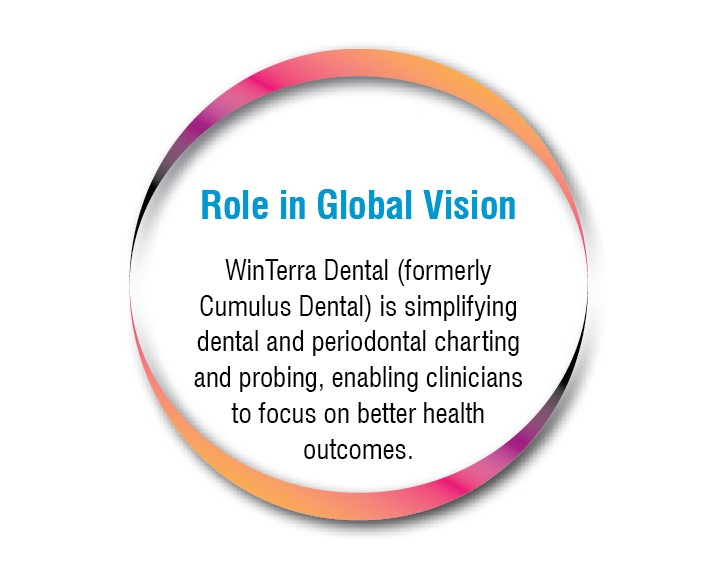 WinTerra Dental (formerly Cumulus Dental) develops and sells innovative products that simplify periodontal charting and probing. Our products are easy-to-learn and integrate simply into the daily routines of dental practices. SmartChart™, our first product, is like a virtual periodontal charting assistant. It uses voice recognition technology to chart probing measurements quickly and accurately—no need for a second operator. SmartChart™ makes periodontal charting more efficient, leading to additional revenue and better health outcomes for patients. SmartChart’s™ state-of-the-art voice recognition software records your periodontal measurements quickly and accurately. The digital periodontal chart is clear and easy to read. And the 3D odontogram helps your patients to understand how a procedure will help them, making them more likely to proceed. © 2019 WinTerra Global Technologies. All rights reserved.